Please click on the image for photos of Bangkok: "Loi Kratong"
My friend Noy and I celebrated Loi Krathong on Sunday. Along with thousands of other celebrants we floated our krathong on the Chao Phraya River. Loi Krathong takes place on the evening of the full moon of the 12th month in the traditional Thai lunar calendar. In the Western calendar this holiday usually falls in November. "Loi" means "to float" and a "krathong" is traditionally made from a section of banana tree trunk. Modern krathongs are more often made of bread. Regardless of the composition, a krathong will be decorated with elaborately-folded banana leaves, flowers, candles and incense sticks. A low value coin is sometimes included as an offering to the river spirits. 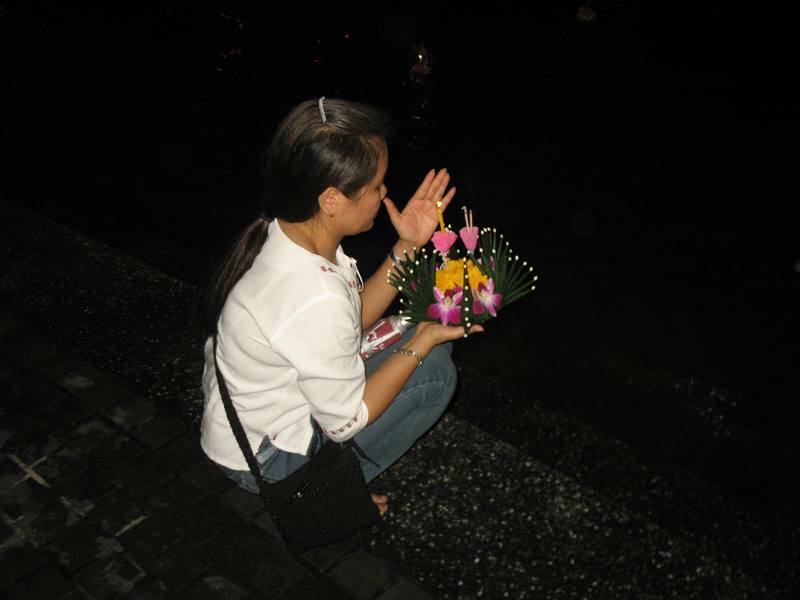 During the night of the full moon, Thais will float their krathong on a river, canal or a pond or lake. The festival is believed to originate in an ancient practice of paying respect to the spirit of the waters. Today it is simply a time to have fun. There's food, music, beauty contests, fireworks, giant lanterns that float up into the night sky, and more food. The festival was adapted by Buddhists in Thailand as a ceremony to honor the original Buddha, Siddhartha Guatama. Apart from venerating the Buddha with light (the candle on the raft), the act of floating away the candle raft is symbolic of letting go of all one's grudges, anger and defilements, so that one can start life afresh on a better foot. People will also cut their fingernails and hair and add them to the raft as a symbol of letting go of the bad parts of oneself. Many Thai believe that floating a raft will bring good luck, and they do it to honor and thank the Goddess of Water. Thanksgiving is also upon us here in Bangkok. Bully's, a local bar-restaurant near my apartment is offering a buffet with all the trimmings. I expect that my American friends and even a few non-Americans will join me for roast turkey, stuffing, brussels sprouts and pecan pie. Sunday night was a delightful evening. I was reminded again how fortunate I am to be here and to join in the holidays with my devoted friends and the welcoming community. On Thursday, I am reminded again of how much I have to be thankful for.